A ferry service is adopting the latest technology to keep passengers informed of sailing timings through the internet blog site Twitter. 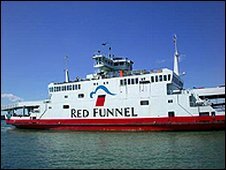 Red Funnel, which operates car and passenger ferries between Southampton and the Isle of Wight, will be using onboard sensors to track its vessels. Data analysis computers will then send messages via Twitter to customers' mobile phones and computers. The Red Funnel website will also be updated on the boats' whereabouts. The firm has teamed up with IBM to offer the service, which also aims to keep transport companies informed of any unforeseen delays caused by weather or technical problems or medical emergencies.